2Lt Gene A. Witterstetter (CP)(KIA) - 4 credited missions flown: 2 with Capt Adams (Missions 8, 9); 2 with Capt John W. Farrar (Missions 1, 7). KIA on 3 January 1943 (Mission 9). Name is on the Wall of Missing Brittany American Cemetery, France. 2Lt Glen M. Herrington (N)(WIA/POW/Repr) - 5 credited missions flown: 2 with Capt Adams (Missions 8, 9); 3 with other Pilots (Missions 1, 2, 5). Wounded on 3 January 1943 (Mission 9). Parachuted in the sea 30 meters from the Bay of La Baule Pins Beach, was rescued by Germany troops and became a POW. Suffered from a badly wounded leg that was amputated by German Doctors. He was later one of the first 8th AF POWs who was repatriated. He arrived in Washington, DC after an arduous journey through four countries. He married the nurse who treated him in a Washington, DC hospital. 2Lt Michael L. Libonati, Jr. (B)(KIA) - 4 credited missions flown: 2 with Capt Adams (Missions 8, 9); 1 with Major Charles E. Marion (P) and Capt Lewis E. Lyle (CP) (Mission 1) and 1 with Capt Lewis E. Lyle (P) and Major Richard D. Callaway (CP)(Mission 2). KIA on 3 January 1943 (Mission 9). T/Sgt Alfred M. Union (R) (KIA) - 3 credited missions flown: 2 with Capt Adams (Missions 8, 9); 1 with 1Lt John W. Farrar (Mission 1). KIA on 3 January 1943 (Mission 9). Name is on the Wall of Missing Brittany American Cemetery, France. S/Sgt Alan E. Magee (BTG)(WIA/POW) - 7 credited missions flown: 2 with Capt Adams (Missions 8, 9); 5 with other Pilots (Missions 1, 2, 3, 5, 7). On mission #9, 3 January 1943, he was wounded in his Ball Turret and discovered that his chest pack had a large hole in the middle. 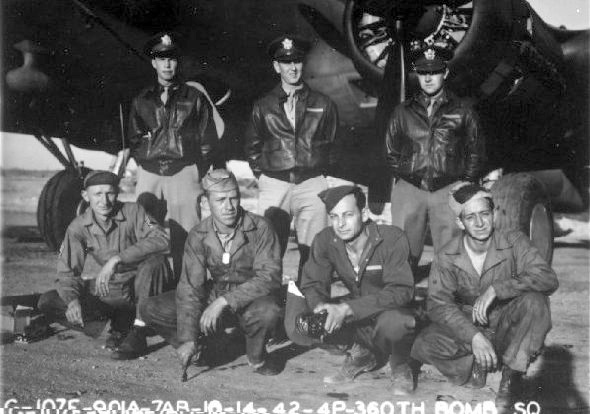 He made his way to the bomb bay waiting for T/Sgt Alfred M. Union (R) to bail out. The B-17 exploded before he could bail out and he was tossed out unconscious from the B-17 without a parachute. He fell over 20,000 feet and crashed onto the glass roof of the St. Nazaire railroad station and tangled in the steel girders. He was badly wounded. His arm was nearly torn off and had badly damaged teeth, legs, knees and ankles. Was cut down from the roof by German soldiers. He was well treated by German doctors in a series of hospitals and at his POW camp. After his rescue in St. Nazaire, and his miraculous survival, l he stated: "I don't know how I got there, but here I am, thanks to God. See the Alan Magee Story. S/Sgt Edward W. Durant (RWG)(KIA) - 4 credited missions flown: 2 with Capt Adams (Missions 8, 9); 1 with Major Charles E. Marion (P) and Capt Lewis E. Lyle (CP) (Mission 1) and 1 with Capt Lewis E. Lyle (P) and Major Richard D. Callaway (CP) ( Mission 2). KIA on 3 January 1943 (Mission 9). He is buried in the Brittany American Cemetery, France. Sgt Marvin L. Milam (LWG)(KIA) - 3 credited missions flown: 2 with Capt Adams (Missions 8, 9); 1 with 1Lt Paul F. Flickenger (Mission 5). KIA on 3 January 1943 (Mission 9). He is buried in the Brittany American Cemetery, France. S/Sgt James I. Gordon (TG)(WIA/POW) - 4 credited missions flown: 2 with Capt Adams (Missions 8, 9); 1 with Major Richard D. Callaway and Capt Jacob W. Fredericks (Mission 1) and 1 with 1Lt Paul F. Flickenger (Mission 5). Became a POW on 3 January 1943 (Mission 9). 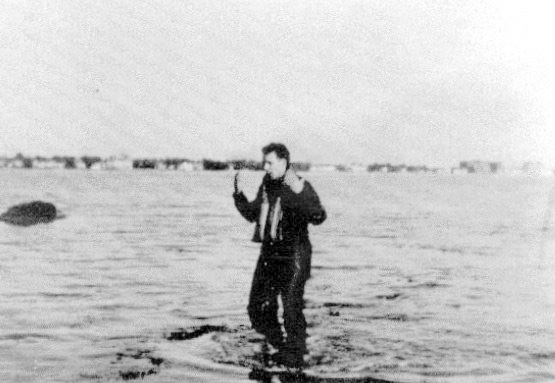 S/Sgt Gordon parachuted into the sea, 30 meters from the Bay of La Baule Pins beach at Saint Nazaire, France. Two Frenchmen swam into the sea and rescued the wounded S/Sgt Gordon who was captured by German soldiers and became a POW when he reached shore. (Capture photo from Alan Kossura who witnessed S/.Sgt Gordon (TG) and 2Lt Harrington (N) parachuting into the sea. He obtained the photo that was taken by another unnamed Frenchman. Photo was presented to Harry D. Gobrecht on 12 May 2001 at the Mighty 8th AF Museum). Mission #9, 3 January 1943 to Saint Nazaire, France in B-17F 41-24620 Snap! Crackle! Pop! (360BS) PU-O. The B-17 received a direct flak hit, went into a spin and blew up. It crashed at La Baulelas, France (Missing Air Crew Report 14464). Three crewmen escaped from the B-17 when it blew up and became POWs - 2Lt Herrington (N), S/Sgt Magee (BTG) and S/Sgt Gordon (TG). The other seven crewmen were killed.